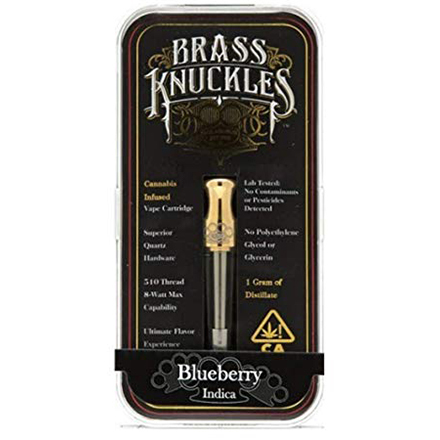 Anyone who enjoys their cannabis cartridges ought to be familiar with the Brass Knuckles brand. Until relatively recently it was considered one of the strongest, smoothest and most reliable on the market. If you can find the real deal then those accolades are still well deserved. Yet unfortunately, and just like many other big names in the business, the brand has been compromised by a flood of bootleg knockoffs. Naturally, this presents a considerable problem for the general stoner. The temptation to 'take a punt' on very cheap Brass Knuckles cartridges found online can be overwhelming - even if the result is a pale imitation of the real thing. So let's discuss the many merits of the real product, and also expose the many risks involved experimenting with the bootleg market. Before we dive into chatting about the many problems facing this brand, let's start on a positive and highlight the merits of the real deal cartridges. Fronted by rapper Xzibit (with Dr. Dre, no less, as a silent partner) these cartridges received major acclaim when they first hit the scene. Not only were they considered the strongest - 90% THC is some cases subsequently reduced to a more manageable 70% - but also the most flavorful and well designed. Each 1g cartridge delivers about 200 hits - pretty great value given the low retail price. But it is the variety and quality of the flavors that represent the standout feature of the real Brass Knuckles range. There's at least half a dozen varieties of indica, sativa and hybrid strains available including some with additional fruity zest. Even better these capsules also retain plenty of natural terpenes which are specifically retained thanks to their use of CO2 extraction techniques (the same used to decaffeinate coffee beans!). Being all natural and eco-friendly tends to equate to a kickin' taste. It's that simple and the authentic Brass Knuckles have that pretty much perfected. Another quality that this range offered is one that has frequently been ignored by their rivals. These cartridges are super discreet and perfect for the vaper on the go. While they generate a deliciously smooth throat hit, they don't expel great big clouds of stinky vape. Sure there's a draw, but it isn't excessive and that quality will remain from the first draw until the very last. Burnout simply doesn't happen with these authentic cartridges when used properly. Just keep your device to 3V - any more is unnecessary and will burn through much quicker while potentially causing your oil to get too thick and sticky. Just follow the instructions folks! Let's start with the pesticide problem. You can read about the details elsewhere but in a nutshell, one guy fell sick after using a Knuckles branded cartridge. Obviously, this caused some consternation and after lab testing, some products were red flagged for containing dangerous levels of pesticides. For a company who uses the best standard of extraction possible, this was clearly a major issue! Just to add to the confusion and shock, it was never made absolutely clear whether or not those tested cartridges were actually authentic products or shady counterfeits. The next stage really depends on who or what you choose to believe. Brass Knuckles claimed that there was no way those tested products could have been authentic, and shifted the blame to the rapidly expanding market for knock-off copies of their product. It may sound like an easy excuse but there is most certainly a reasonable level of fact to this. You can easily find replica packaging for their whole range online - a few dozen boxes will cost you about $50. Most likely these are sourced from China and used by low-quality US-based weed farmers to sell appalling quality oil cartridges under a premium brand name. In absolute honesty, we side with Knuckles on this one. It just would not make sense for a company valued at just shy of $200m with a stellar reputation to start cutting corners, ripping off their customers and jeopardizing their health. If it could be proven that the contaminated oil was from their harvest then one lawsuit would potentially bankrupt them - so why risk it? There's also the absolute fact that Dr. Dre is a serious businessman and would never approve such stupidity (probably!). While there is a civil suit against them over the pesticide issue (that is very unlikely to be successful due to lack of proof) there is also another concerning their advertised THC levels. When testing demonstrated that their 'Forbidden Fruit' concentrate was actually 71% instead of 90% THC this caused a bit of a problem. So much so that they took the official website offline for a little while, and when it reappeared the listing had been magically changed. It is impossible not to smell something a little bit fishy about this! Make no mistake, the original Knuckles range was from personal experience very strong indeed. But there is a big difference between claiming to be 'extra powerful' and placing a precise percentage strength. If a product fails to make the mathematical grade then that's false advertising and frankly, it appears they have been caught red-handed. Disappointing - yes. Enough to blacklist what is otherwise a great product - no. Not in our opinion anyway. There is no doubt that plenty of dodgy people are piggybacking on this brand and illegally using it to sell trash concentrates. More often than not the victims of this are going to be located in prohibitionist states buying on the black market. Those fortunate enough to live in more enlightened states can buy from proper stores who will (or ought to) guarantee the provenance of their products. From the Brass Knuckles' perspective, being so thoroughly exploited by the black market vendors is causing not just a massive loss in revenue, but also destroying trust in their brand name. Perhaps learning from their previous errors they have released a comprehensive checklist for people to evaluate the difference between their real product and those pushed out by the counterfeiters. To be fair, it is pretty comprehensive and lists everything from child locking mechanisms through to compliance/authenticity labels and basic misspellings. A full list can be found on their website. Any successful brand is always going to be prone to being ripped off and the weed cartridge industry is no exception. The difference between a fake Rolex and a fake cartridge is that you don't inhale the watch into your body! Knuckles have done pretty much all the can to alert people to fakes - and more so than most of their competition who are facing a similar problem. Yet this must be taken into account when considering buying their branded products. What is to stop the counterfeiters taking a look at the checklist on their website and using it as a handy review to improve the quality of their fake packaging? Nothing at all. For this reason, we have to suggest that everyone takes caution when considering picking up a Brass Knuckles cartridge - and that is especially the case for those living in illegal states. If you can source the real product (and those in legal states should have no trouble doing so) then kick back and enjoy what is still one of the finest range of cartridges out there. It really is a great product and the range is varied, well crafted and excellent value. Everyone else - approach with care.